Background: Transtheoretical model (TTM) is one of the most commonly used methods in behavioral change modeling. The aim of this study was to conduct a systematic review (SR) to determine research gaps with regard to this template with an emphasis on intervention for patients with chronic diseases (CDs). 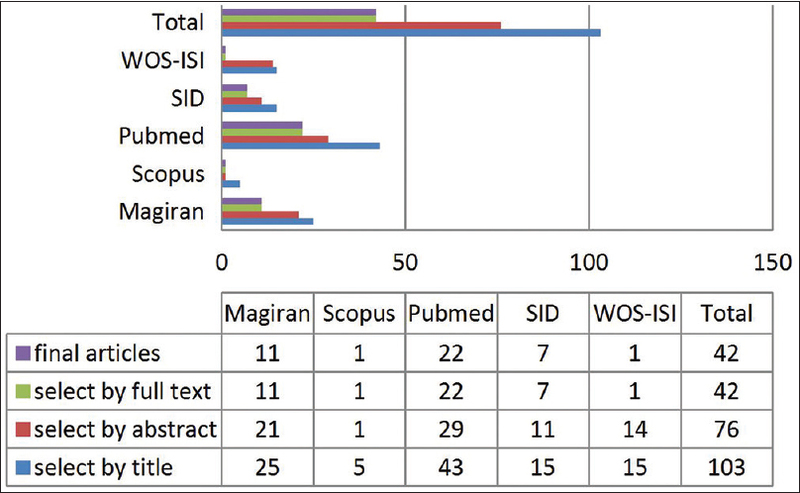 Materials and Methods: ISI-WOS, Scopus, PubMed, SID, and Magiran databases were examined systematically and on the basis of defined criteria. Titles, abstracts, and full texts of articles retrieved were examined for the presence of defined criteria. Then finalized articles were analyzed in consensus meetings. After that, references of selected articles and full text of those meeting the criteria were also analyzed Results: We screened 103 articles, excluded 27 in abstract review and 34 in full-text review, leaving 42 articles for critical appraisal. Then the references of these 42 articles were also screened. Fifty articles were excluded on abstract review and 5 on full-text review, leaving 15 articles. The result of the analysis of 57 final articles of this SR determined that 28 articles were about aspects of TTM and 5 stages of change were the most commonly used aspect. Eight articles used TTM in intervention about CDs. A total of 21 articles examined TTM's pros and cons, most of which were about TTM's pros. Conclusions: The majority of studies focused on the effectiveness of TTM on the behavioral change management. This finding supported the hypothesis that TTM can be applied in the prevention of CDs. Background: Self-learning module (SLM) is designed for independent learning. In this study, the hypothesis that SLM is effective to some extent in improving clinical competence in nursing students was tested. Materials and Methods: The study employed a randomized controlled design. 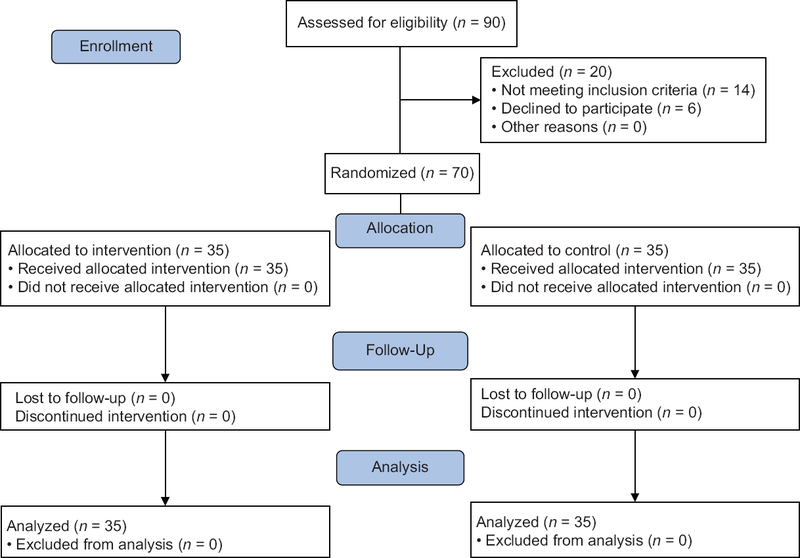 In this study, 46 nursing students were randomized into the control or intervention group. Study tools included a demographic information form and nursing skills checklist. Unlike the control group, the intervention group received clinical SLM. Nursing students' clinical competency was measured at the end of the intervention through objective structured clinical examination. Statistical analysis was performed in SPSS software. A p value < 0.050 was considered statistically significant. Results: In total, 46 students participated in this study. The Mean (SD) age of the study participants was 18.80 (1.06) years. 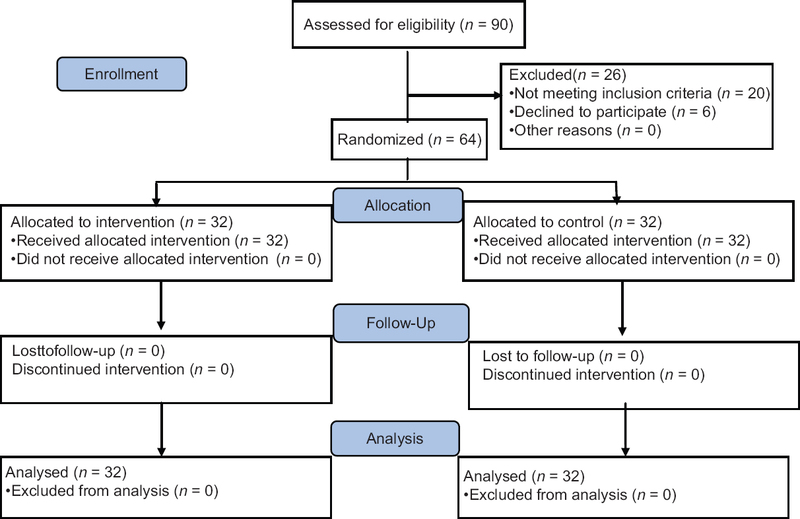 There was a significant difference in students' clinical competency between the control and intervention groups (Mann–Whitney U-test:p= 0.010). Mean (SD) of clinical competency in the control and SLM groups was 58.19 (6.41) and 62.83 (6.05), respectively. Results of the group equivalency test indicated that all demographic variables were equivalent between the groups. Moreover, there was no significant difference between women and men in terms of clinical competency. Conclusions: According to the results, the use of SLM could help the students enhance the quality of nursing clinical competency. Background: Attention-deficit hyperactive disorder (ADHD) is the most common behavioral disorder of childhood, and due to its chronic nature, it would affect all the aspects of life of the child and the caregiver. Therefore, this study was conducted to determine the effect of a program based on the needs of caregivers on stress, anxiety, depression, and burden of care in families of children with ADHD. Materials and Methods: This randomized clinical trial was conducted on 70 family caregivers of children with ADHD from June to September of 2016. After convenience sampling, eligible samples were randomly allocated into two groups of control and intervention. The intervention group received the need-based educational program in eight sessions and the participants of the control group participated in two group sessions where they expressed their problems and experiences. Data were gathered through Zarit Burden Interview and Depression Anxiety and Stress Scale (DASS)-42 and then were analyzed using descriptive and inferential statistics. Results: The mean scores of stress, anxiety, depression, and burden of care had a significant difference between both groups right after and 1 month after the intervention (p < 0.001), whereas in the control group, there was no gradual decrease in the mean scores of the dependent variables. Conclusions: The need-based educational program might reduce the level of stress, anxiety, depression, and burden of care in families of children with ADHD. It is recommended to develop similar programs and evaluate them through various studies. The use of nonpharmacological treatment of these children is evident in the results. Background: Mental health problems such as anxiety and disappointment are common in patients with heart disease, resulting in poor outcomes. The purpose of this study was to compare the effectiveness of two methods of relaxation and prayer therapy on anxiety and hope in patients with coronary artery disease (CAD). Materials and Methods: A quasi-experimental study was conducted in three groups of 25 subjects (i.e., two groups of relaxation and prayer therapy and one control group) and two stages (i.e., pretest and posttest) in hospitals affiliated to Isfahan University of Medical Sciences, Iran. Data collection instrument consisted of three parts: (a) demographic and individual characteristics of the subjects, (b) Beck Anxiety Inventory, and (c) Snyder's Hope Scale. The interventions consisted of Benson's relaxation and prayer therapy. Data were analyzed using descriptive and inferential statistics. Results: The results showed that there was a significant difference between the mean score of anxiety after intervention in the three groups which was related to each of the relaxation and prayer therapy group with the control group. Also, the result of analysis of covariance with controlling the effect of pretest revealed significant between-subject effects of interventions on posttest scores of hope (F(2, 71) = 8.55, p = 0.012, ηp2 = 0.12) and anxiety (F(2, 71) = 4.71, p < 0.001, ηp2 = 0.19). 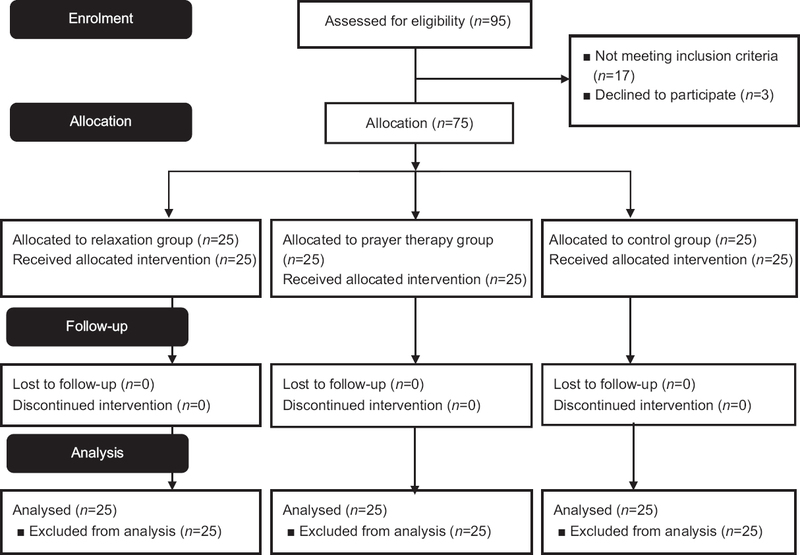 Conclusions: Both relaxation and prayer therapy interventions are effective in promoting hope and reducing anxiety in patients with CAD and provide optimal, short-term, and easy-to-follow options for the health team. Background: Breast cancer is a very common cancer in women which is diagnosable using inexpensive, accessible, and easy screening programs in the early stages of the disease. Culture, beliefs, and opinions of women affect adoption of screening techniques. Nursing professionals are supposed to be aware of such influencing factors. Therefore, this study was conducted to investigate barriers to breast self-examination (BSE) among women in Isfahan province. Materials and Methods: During a cross-sectional descriptive and correlational study in 2017, 1509 women in rural and urban areas of Isfahan province were selected using multistage sampling method. Data were collected by visiting homes, using a questionnaire, and conducting interviews and were analyzed using descriptive and analytical statistics. Results: The results showed that barriers consisted of lack of awareness about breast examination (p = 0.006), lack of awareness about BSE techniques (p < 0.001), and lack of training by personnel of healthcare centers (p = 0.016), which were significantly associated with residency areas (i.e., urban and rural areas). Moreover, women's educational level was significantly associated with 5 of 10 barriers and their occupation was significantly associated with 2 of 10 barriers to BSE. Conclusions: Among the several factors that may affect BSE, a part of them in Isfahan women act as obstacle that they are moderated by some demographic factors such as residency areas, education level, and occupation. Therefore, nursing plans and interventions aimed at developing BSE should be tailored to suit the unique demographic characteristics of women. Background: The newborn individualized developmental care and assessment program (NIDCAP) is a new multifaceted approach, which is developmentally and functionally supportive of health especially in premature newborns at the neonatal intensive care unit (NICU). 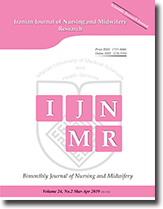 This study is designed for assessing the knowledge and perception of nurses as the most important members of the multidisciplinary team of NIDCAP about this program. Materials and Methods: This cross-sectional study was conducted on 120 nurses working in the NICUs of Alzahra, Taleghani, and Children hospitals affiliated to the educational and treatment centers of Tabriz University of Medical Sciences as well as 29 Bahman Hospital affiliated to Tabriz Social Security Organization in 2016 using census sampling method. Three questionnaires were employed to collect demographic data and to explore the nurses' perceptions and knowledge of the NIDCAP program. Results: Findings of the study indicated that the mean (SD) nurses' knowledge and perception scores for NIDCAP were 71.83 (1.64) and 76.80 (0.79), respectively. In the terms of knowledge, significant differences were found with regard to being married (t = -2.39, p < 0.019), having an MSc degree (t = -2.14, p = 0.034), and employment experience (t = -3.38, p = 0.001). However, there was no significant relationship between perception and demographic variables (p > 0.05), nor was there any significant relationship between perception and knowledge (p = 0.275). Conclusions: The results of this study showed that the majority of nurses participating in the study had high knowledge about NIDCAP. Background: Teaching methods have failed to keep up with the pace of the changing curriculum. Clinical practice, an essential part of nursing education, links theory with practice, particularly in midwifery nursing. Thus, this study aimed to compare the effects of video-assisted teaching programs and traditional demonstration on nursing students learning obstetrical palpation skills. Materials and Methods: This is a quasi-experimental research work with pretest, posttest, control group design in which 60 third-year students of Bachelor of Science in Nursing were selected and assigned randomly, by lottery method, into an experimental group (video-assisted teaching program) and a control group (traditional demonstration) regarding obstetrical palpation. The data were collected through a self-designed rating scale. The validity of the rating scale was established by a panel of seven experts from the field of obstetrical and gynecological nursing, and the reliability was established through Cronbach's α(0.78), which showed the tool was consistent among the population. Results: The results showed a significant difference between the pretest and posttest skill scores of students who were exposed to video-assisted teaching program and traditional demonstration (t = 18.35, p < 0.001). Although both the methods were equally effective in enhancing skill, traditional demonstration scored much better than the video-assisted teaching program when the posttest skills were compared (t = 36.40, p = 0.001). Conclusions: The routine educational method, i.e., demonstration, is more effective in developing skills emphasizing the reinforcement of academicians in enhancing teaching skills by adopting blended teaching technique for enhancing memory storage, retrieval, cognition, and learning. Background: There is limited research on gerontological nursing competence in hospitals. However, there is no comprehensive and integrated description of the gerontological nursing competence requirements in hospitals. The purpose of this study was to explain the components of nursing competence in caring for older people in Iranian hospitals. Materials and Methods: This is a qualitative descriptive-exploratory study. The data were collected through a semi-structured interview with nurses, nurse managers, and clinical educators in teaching hospitals and nursing schools affiliated to Arak, Isfahan, and Tehran Universities of Medical Sciences in Iran from September 2015 to July 2016. Participants included 25 people who were selected by purposive and snowball sampling method. Sampling continued until data saturation. Data were analyzed using conventional content analysis method. Results: Data analysis generated three main categories including (1) Patient and family centered care; (2) Process-oriented care; and (3) Self-care and continuing professional development. Conclusions: Nurses should have competencies such as participation and empowerment of the patient and family; ease of comfort in the elderly; comprehensive geriatric assessment; development, implementation and evaluation of care plan; development of knowledge and clinical proficiency; and coaching so that they can work effectively during the care of the elderly. The results of this study can be used by nursing educators, nursing students, and nurses to develop their individual and professional skills in the field of gerontological nursing. Background: Drug dependence is one of the current problems that leads to the drug dependents persons' suffer and imposes a huge mental burden to their family members. This study aimed investigating to determine the effect of cognitive- behavioral therapy (CBT) on the burden of the caregivers of drug dependent people. In CBT, caregivers discover thought and behavioral mistakes and recover them. Materials and Methods: This randomized controlled clinical trial was conducted on 64 caregivers of drug dependent individuals referring to one of the clinical and educational centers in Isfahan, Iran, which were randomly assigned to two equal groups (intervention and control) in 2016. Intervention group under went eight 90-min CBT sessions, whereas control group attended 3 group sessions to express their experiences. Data were collected by Zarit Burden scale and the demographic questionnaire and analyzed by independent t-test, Chi-square, and ANCOVA repeated measure through SPSS 18. Results: Before the intervention, no statistical difference was observed among two groups in the mean scores of burden (t = 0.75,p= 0.46).There was a significant difference between three time points in the intervention group (F = 3.24, p < 0.001). However, care burden mean score did not show a significant reduction in the control group (F = 0.17,p= 0.96). Conclusions: The CBT can lead to reduction of burden in drug dependent caregivers'. We suggest encouraging nurses to establish educational programs such as CBT to maintain and improve caregiver's mental health. Background: Because of the increasing number of the elderly, the need for care in aged nursing homes (NHs) is increasing. As a cultural perspective toward care is new, it is very important to understand the communication behavior of the elderly in various cultures. This study aimed to explore the communication behaviors among the elderly in NHs in Kerman, Iran. Materials and Methods: This ethnographic focused study was conducted on 25 staff members and 8 residents in two NHs in 2015. Data were collected through observation of the participants, field notes, and semi-structured deep interviews in Kerman. Cuba and Lincoln method was used to ensure the trustworthiness of the data. The collected data were analyzed through content analysis. Results: By analyzing primary codes, 3 categories and 8 subcategories were extracted through content analysis including fluctuation in communication (task-oriented communication, avoidance of communication, and establishment of effective communication), artificial collaboration (fake friendships, jealousy, and its consequences, and cooperation in concealing error), and lack of collaboration among team members (fragmented teamwork, extreme working conditions, and physical burnout among the elderly). Conclusions: The results of this study indicate that communication problems between caregivers and the elderly are high. Thus, it is necessary that people who care for elderly indiviuals are trained regarding special communication strategies and skills, and they are not influenced by fatigue and burnout resulting from caring. Background: The family caregivers of patients undergoing hemodialysis are faced with multiple physical, psychological, social, economic, and spiritual problems that increase their care burden. The present study was conducted to determine the effects of a family-based training program on the care burden of family caregivers of patients undergoing hemodialysis. Materials and Methods: The present controlled, randomized, clinical trial was conducted on 70 caregivers of patients undergoing hemodialysis in Ali Asghar and Zahray-e Marzieh hospitals in Isfahan, Iran, in 2017. After conducting convenient sampling, 70 participants were randomly assigned into 2 groups (35 in each group). The experimental group received the family-based training program and the control group received usual care plan. Data were collected using the Zarit Burden Scale before, immediately after, and 1 month after the intervention and were then analyzed by independent t-test, Chi-square, and Analysis of Covariance (ANCOVA) repeated measure. Results: The results showed that both groups were homogeneous in terms of their demographic data and showed no significant differences. 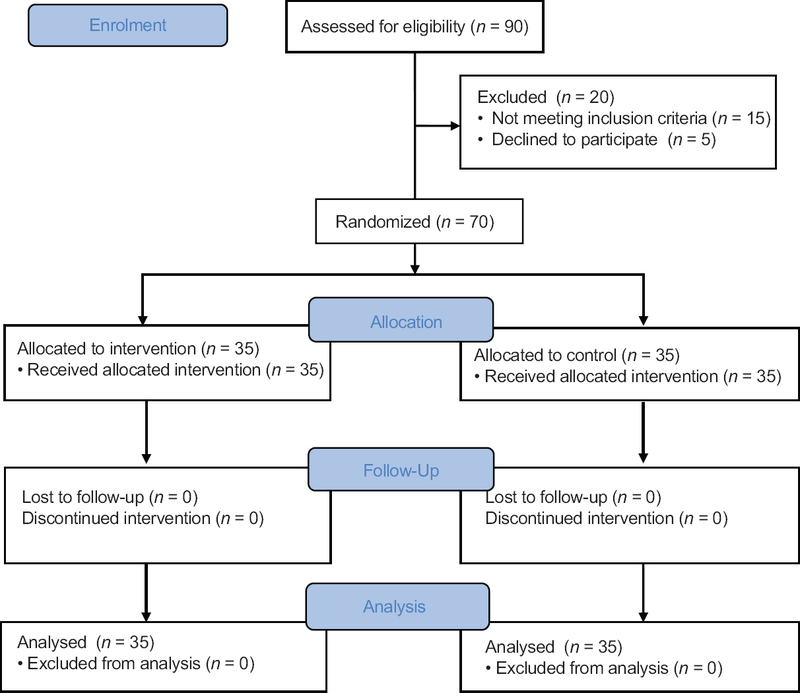 The main effect of group was significant, indicating a significant decrease in care burden in the experimental group after the intervention (F1,67 = 1089, p < 0.001). 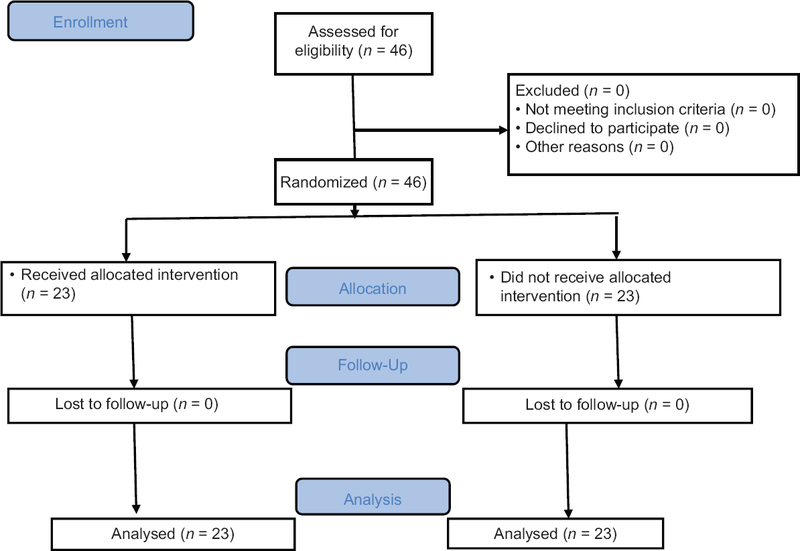 However, the interaction of time and group was not significant, indicating insignificant difference in burden 1 month after intervention (p > 0.05). Conclusions: Since the family-based training program successfully reduced the burden of care immediately after intervention, similar family-based training programs are recommended to be designed and developed. However, insignificant time effect suggests further researches of long time effects of such program. Background: Critically ill patients admitted to intensive care units (ICUs) frequently experience pain, but the severity of pain in this group of patients is underestimated by the treatment team due to barriers to verbal communication. The aim of the present study was comparing the severity of pain measured by two scales: behavioral pain scale (BPS) and critical-care pain observation tool (CPOT) in ICU-admitted patients during routine daily procedures. Materials and Methods: Ninety patients were enrolled in the study. The severity of pain was measured during resting, invasive (suctioning) and noninvasive (mouthwash and body position change) procedures, and respiratory physiotherapy with two scales: BPS and CPOT. Wilcoxon and Friedman statistical tests were used to compare the score of pain in different situations, and Spearman correlation coefficient was also used to measure the correlation of pain score measured by two scales. Results: Patients experienced no pain during resting, mild pain during changing position, and respiratory physiotherapy, mild-to-moderate pain during mouthwash and moderate pain during secretion suctioning. Wilcoxon test used for pairwise comparisons between pain score in different situations showed a significant difference in both scales (p < 0.05). There were positive and strong correlations (r > 0.80, p < 0.05) between the pain score measured by BPS and CPOT from ICU-admitted patients in all procedures. Conclusions: Critically ill patients in ICU experience a different range of pain in routine daily care. BPS and CPOT scales could be used successfully for monitoring of pain in this group of patients. Locked twins is a rare and dangerous multiple pregnancy and generally occurs in about 1 in every 1000 twin births. A 23-year-old female with gravida 1, para 0 pregnancy was admitted. The head of the first fetus was locked to the chin of the second fetus (alive) at the top of the symphysis pubis. The uterus was relaxed with isoflurane. The legs and the back of the baby were extended to the symphysis pubis. The head of the second baby was gently positioned to the posterior walls of uterine cavity on the upper side of it. So, the locked head of the first baby was released and both fetuses were delivered vaginally. The second baby was in good condition. By recognizing the probable cases, radiological diagnosis, and punctual cesarean delivery, it is possible to avoid the fetal morbidity and mortality in locked twins.